I've always loved all his songs, back from his time at Wham! going through all his songs to the present. So imagine how excited I was when in March I heard that George Michael was coming to Amsterdam. I was first really bummed when I realised the tickets would start going on sale when I was going to be on a plane crossing the Atlantic on my way to Aspen...however when I was back from holidays I managed to find some tickets. 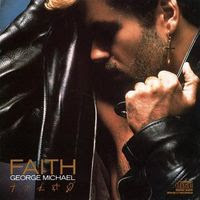 And I was happy to find out that Aissa liked George Michael as much as me. So we got the tickets. D day finally came last week, Tuesday 26th. 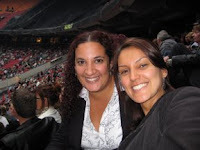 Aissa and me met in the metro station close to the Amsterdam Arena. After getting some food among the large amount people forming queues everywhere, we decided to get in. We were happy to see we had quite nice seats in the South part of the stadium. That meant that we could see George right in front of us. The opening act was done by Sophie Ellis Bexter which was rather nice as I like her quite a lot. She sang for almost an hour...so it was a good warm-up. After that we had to wait for almost one and a half hour. The tension was building up. Close to 21:00 the crowd started making the wave around the stadium (about 50,000 people)...it was fun to participate and you can view a small video of it here. Now...I have been to several concerts in the Netherlands, as a "grown up" and of course I love music and I love dancing and my point is that concerts should be full of people who dance and express themselves...but I would say that I went back several years and I couldn't contain myself, I was screaming!!!! ahhhhhhhh (picture current teenager screaming at Justin Timberlake or something similar). I was happy to notice though that Aissa was also part of this...so it was just easier. 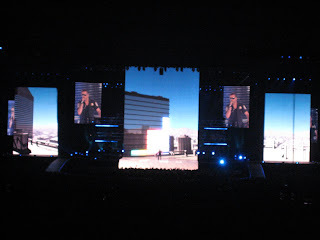 The whole concert was a combination of the old and the new songs from Wham!, songs from his earlier work and the newer ones. 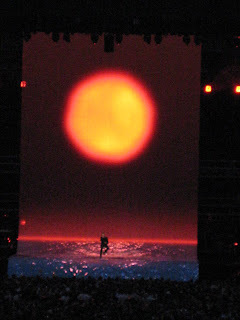 As you will see in the photos the lighting in the stage was unbelievable, one of my favorites was when he was singing "Praying for time", it appeared that he was sitting on the sea with a beautiful sunset in the back. You can view the video by clicking here. After one whole hour of singing and entertaining the audience he went on a 20 minute break after which it looked like a helicopter was getting into the audience, the effect was quite good and after a while he appeared wearing a policeman uniform and he looked SO hot and you must have guessed by now that he sang "Lets go outside". Obviously, Aissa, me and the rest of the crowd went wild! After 40 more minutes of singing he made the whole crowd sang along to a Wham! hits "I'm your man" and "The Edge of Heaven" and he thanked and then left. For a moment I panicked...my experience tells me that Dutch people are rather quiet, and in all the concerts I've been to, I've NEVER heard them chorus an "encore" (except Juanes, but back then the music hall was full of Latin people so that doesn't count). However the Dutchies rose to the ocassion and not only did they screamed, whistled and shouted as if it were "Queen's day", but they even managed to improvise a little "Ole 0le" song...I was rather surprised. I have been told though afterwards by several other people that this might have had to do with the fact that half of the crowd was gay... considering that I didn't really spot many gays around me I'm not so sure about the truth of that statement. However I was VERY happy because after about 5 minu tes...George came back and did a memorable performance of "Careless Whisper". By that point I almost didn't have any voice left and I sang and sang along (don't laugh at me when you hear my voice in the background of the video) and this brought back memories of summer of 1985...when I was not even close to being a teenager how I loved that song because it was the last favourite song of my grandma. 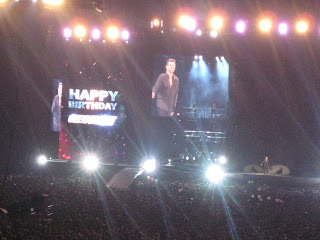 He then left again and suddenly his band started playing "Happy Birthday" as just the day before he had turned 44. The whole crowd joined in to the song and then George clapped at us and thanked us for our beautiful singing...he then thanked his band, he thanked us and he did the last song of the evening: FREEDOM!!! Which was obviously unbelievable!! Aissa and me left the stadium at around 11:45....in great joy, totally in George Michael mood and with a hunch of a sore throat for the next day. I normally wouldn't do this, but I have to because I was RATHER impressed by the quality, considering I was so far from him (I was south and I had the whole stadium to cross): All videos and photos have been taken with my brand new Canon Digital IXUS 75 ;-) (PowerShot SD750 in the American market) I love it already!